Ohh it's almost here! Are you ready? I'm as ready as I'll ever be! Today is for a few last minute errands and then let the festivities begin. Frankie will be home late afternoon, fingers crossed for her the traffic isn't too bad. I hope that your Christmas is a joyful one! Merry Christmas Pam, to you and your family! Merry Christmas Pam! Have a wonderful day with your family! Merry Christmas Pam!! Enjoy the family time, lots of love and laughter...oh and chocolate! Merry Christmas to you and yours, Ms. Pam! Merry Christmas to you and your family! 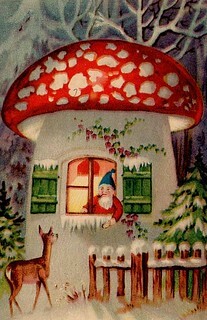 Love your gnome and his home!